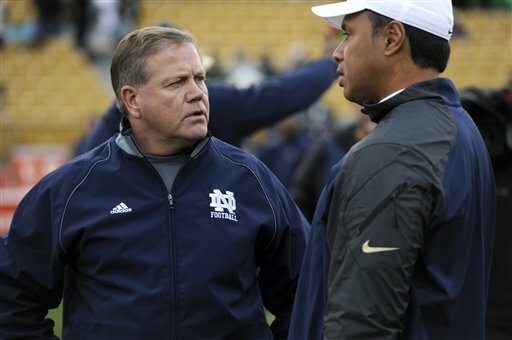 When he’s not busy riding a horse to training camp, Notre Dame head coach Brian Kelly is entering heavy preparations for the 2014 college football season. That prep involves chalk talks, two-a-day workouts and, naturally, talking to ESPN reporters. Regardless of what Navy fans think of Kelly, or the Fighting Irish, or horses, they should be pleased with a response he gave to a recent ESPN poll, asking coaches of the so-called “Power Five” schools about scheduling preferences. A quick primer: The Power Five consists of teams in the Atlantic Coast, Big Ten, Big 12, Southeastern and Pacific-12 football conferences (and independent Notre Dame). The group of schools recently earned the right to all but police themselves within the NCAA Division I football structure, setting the stage for possible changes to what benefits student-athletes can receive and how schedules are created. ESPN surveyed the Power Five coaches on whether they’d prefer a schedule limited to the Power Five — ending the sometimes-lopsided nonconference games that can help pad a team’s won-loss record (or, if things go the other way, get their own Wikipedia page). Throwing out the undecided votes, the majority of coaches said they would like to stick with the Power Five. Kelly wasn’t among them. Even though Notre Dame has never played an [Football Championship Subdivision] team and plays almost exclusively Power Five opponents already, Irish coach Brian Kelly said he would be against it if it meant no longer playing Navy. Navy, set to enter the American Athletic Conference in 2015, frequently features Power Five teams on its schedule — the Mids open the season against Ohio State later this month, for example. Games like that, plus the rivalry with the Irish that dates to 1927, could vanish if the Power Five cuts the lower-level schools off its slate. Ohio State’s Urban Meyer stood with Kelly against the plan, as did Wake Forest’s Dave Clawson, whose team will host Army on Sept. 20. Stanford’s David Shaw, whose Cardinal will host the Black Knights seven days earlier, was for it. Get the full service-academy football slate here.